Four pages into The Hunger Games, Suzanne Collins presents us with a description of something that sounds both delicious and precious. A special occasion food for the reaping from Katniss’ darling sister Prim, hidden under a bowl so that Buttercup couldn’t steal it. To do this, I decided I’d better at least make some of the same effort as Prim and make my own goat cheese. You can read about how I did it here. It’s surprisingly easy. To form the cheese, I simply took some in my hands and made a small rounded square. I took some washed basil leaves and cut the thick parts of the stem off. I wrapped leaves around from the bottom to ensure that part was covered. The tips of the leaves would form the little tip at the top. Since I live in a hot climate, the cheese was very soft and squishy. I figured the Everdeens didn’t have a fridge and so I figured chilling mine would be cheating, but then later I realized that it was probably pretty cold where they were and that would have kept the cheese in a nice, solid form. That would explain why Katniss could put it in her pocket and not have a mushy goat cheese pocket. I’d bought twine to tie it up, but I thought this looked nice by itself so I left it. May the odds– be ever in your favor! Don’t forget to follow Fictional Food on Twitter and Like Fictional Food on Facebook! 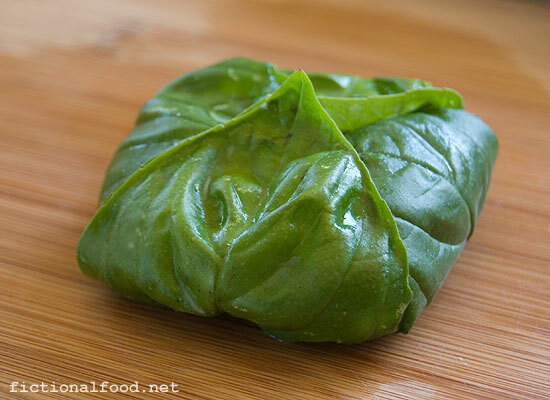 On the morning of reaping day, Prim leaves her sister Katniss a “perfect goat cheese wrapped in basil leaves”. Form goat cheese into a rounded square. Trim basil stems from the bottom. 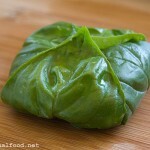 Place the bottom end of the leaves under the cheese, folding the tip up. Lay two opposing leaf tips down flat, sticking it to the cheese. Bring the other two leaf tips up and pinch them together. Chill until nicely hardened. 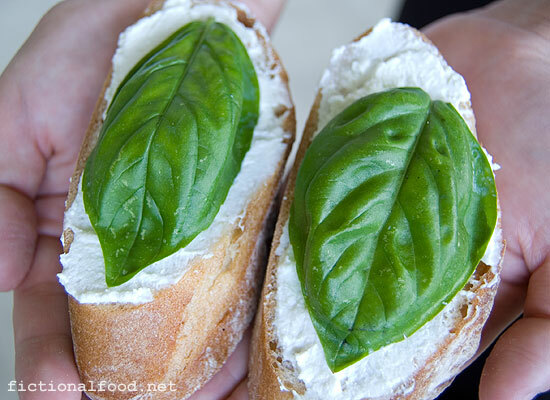 Serve on top of warm sliced bread from Mellark’s bakery and top with a basil leaf. Eat with wild blackberries.